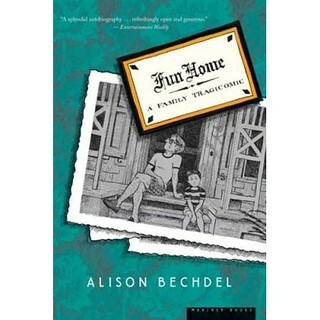 Recently, the Comicazi Book Club read Alison Bechdel's autobiographical graphic novel, Fun Home. A more indie book to be sure, though also one with a lot of critical acclaim. In the CBC we take turns leading book discussions (coming up with questions, facilitating the discussion), and Fun Home was my book to lead. Thankfully there is no shortage of issues to discuss (unlike some of the other books I've had to do....I'm looking at you Silverfish). This graphic novel largely looks at the complicated relationship the author had with her father. Spoiler......... though it is mentioned fairly early in the book, at age 44 Bechdel's father stepped in front of a Sunbeam bread truck, and was killed. Though the investigation was inconclusive, Bechdel herself concludes he committed suicide. A heavy theme in this book is sexuality/gender roles, specifically Bechdel discovering her own - on first seeing a truckstop bull-dyke, and her growing realization that her father was a closeted gay man. Bechdel and her father both try to find the stereotypical gender roles in each other - with neither living up to the others expectation. Literature also plays a huge role in this book, both Bechdel parents were teachers, and books guide Alison through some very pivotal moments in her life. If you want to know more about this book, you can read the wiki or the many articles written about it. My intent here is to give a quick summary, share my questions...and maybe encourage you (comic reader or not), to give this book a read. Truthfully, not everyone in our book club loved this book. I'm not even sure I loved it. But I did like it, and my first reading of it (this was my second) was my first foray into a less "cape" related graphic novel. So more importantly, it took me out of my graphic novel comfort zone because if The Red Menace hadn't recommended it to me, I probably never would have picked it up on my own-it's a bit sad and I usually avoid sad things. That said, it's also open, honest, a little bit hopeful. After reading this, how do you think Bechdel feels about her father? How do you feel about him? How do you feel about her? What about her mother? How do you feel about the choice to tell thus story as a graphic novel rather than prose...what is gained/lost? What role does literature play in this book? Feel free to discuss in the comments section or join the Comicazi Book Club Facebook page.